My laptop does not have RGB or DVI on it for an external monitor, it has just got an HDMI connector. While I was working in the office I thought I’ll pop my headphones in and listen to some music, and was met with silence? When you connect an HDMI device windows ‘assumes’ that you will be outputting sound to that device, (great thanks). 1. Open Control Panel (Window Key+X on Windows 8) > Sound. 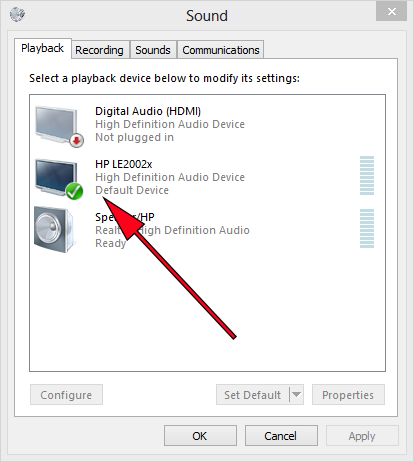 Below you can see it has set the monitor as the default playback device. 2. 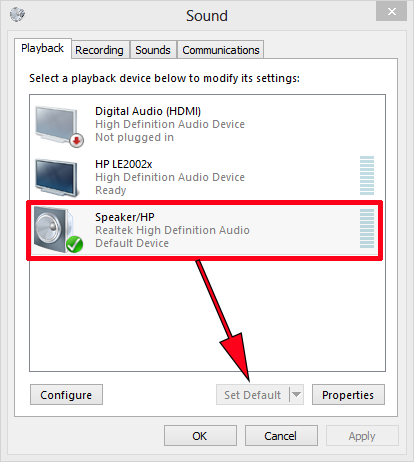 Select your speakers (even if you want headphones, that’s what the HP is for!) > Set Default > Apply > OK.